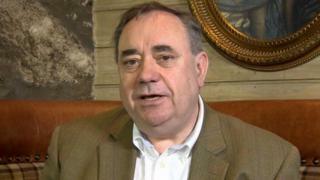 Alex Salmond has said Scotland's education system is "putting in some substantially good performances", as politicians clashed on the issue ahead of the local elections later this week. In a BBC interview, the former first minister defended the Scottish government's record on schools. The Conservatives said Scotland was "tumbling down" international league tables. The Scottish Greens said the SNP government "doesn't yet have a grip on education." On the BBC's Sunday Politics programme, Mr Salmond was asked about cuts to local authority budgets in Scotland. He said: "You have to compare what's happening in Scotland and what's happening in England and there is no doubt that Scottish local authorities have been much better funded than those in England over the last few years, and that's been the ability of the Scottish parliament, the Scottish government, to protect services at local level." Asked by presenter Andrew Neil why, after a decade of SNP government, one in five Scots pupils leave primary school "functionally illiterate", Mr Salmond said Nicola Sturgeon had made it a "top priority" to "address these challenges". He went on: "Let's take another statistic, 93% of Scottish kids are now emerging from schools to positive destinations - further education, apprenticeships or into work." Mr Salmond said: "I'm arguing that in the round Scottish education is putting in some substantially good performances. You can't have a failing education system if you have that 93% going on to positive destinations and, incidentally, a record low youth unemployment in Scotland. These pupils are being prepared by the Scottish education system." "Yet Mr Salmond's response is to insist - 'don't tell me the SNP is failing'," she added. "It shows just how out of touch the SNP has become. Mr Salmond may think his record on education is great - thousands of parents across Scotland beg to differ. "We can send him and Nicola Sturgeon a clear message in this week's council elections: enough with the independence obsession, and get back to the day job we pay you to do." Scottish Labour's general election campaign manager, James Kelly, described Mr Salmond's interview as "car crash" and said it "exposed the reality of the SNP's record in government". He added: "Since 2011 the nationalists have cut £1.5bn from local services like schools and care of the elderly. "There are 4,000 fewer teachers, 1,000 fewer school support staff and 700 teacher vacancies that will take three years to fill under the SNP. "Labour is the only party standing up against SNP cuts that put the life chances of our young people at risk." Scottish Liberal Democrat leader Willie Rennie said: "Sticking his fingers in his ears and shouting 'la-la-la' will not change the truth of Alex Salmond's government's educational performance. "Education slipped down the international rankings when he was in charge because he was more interested in independence than the future of Scotland's children. "Only with the Liberal Democrats can we change the direction of our country away from independence and hard Brexit and towards education investment." The Scottish Greens' education spokesman, Ross Greer, said his party was willing to "work constructively" with the Scottish government to raise standards in education. He added: "So it's disappointing to see an SNP spokesperson, and former first minister, attempt to deflect from the serious challenges facing education in Scotland. "While Greens have been calling on more resources for our schools, the reversal of cuts to teachers and tackling teacher workload, the Scottish government is instead spending time on a governance review that wasn't asked for or needed by teachers, pupils and parents." The Single Transferable Vote (STV) multi-member ward system means that parties try to avoid standing more candidates than they think can win as they can affect each other's chances of securing a seat. Prof Curtice said: "The changes in the number of candidates being nominated by the parties give us a strong clue as to how they see their chances. "The Greens above all are evidently hoping to make a significant breakthrough, while the Tories and the SNP would seem to anticipate doing better than they did five years ago. "Labour, in contrast, would appear to be expecting a setback. "As a result of the sharp reduction in the number of candidates it is fielding, the party can only retain control of Glasgow, West Dunbartonshire and Renfrewshire if every single one of the party's candidates there secures election. "And that will only happen if the party actually manages to outperform expectations." Prof Curtice predicted low turnout, often a problem at local elections, was set to continue, although it may be boosted by national concerns - including the general election, Scottish independence and Brexit. Following the publication of this article, the BBC has acknowledged that there was no basis for the claim, which was put to Mr Salmond by the interviewer, that one Scottish child in five leaves primary school "functionally illiterate".